A Tu-160 strategic bomber is seen in this picture posted on the website of the Russian Defense Ministry. 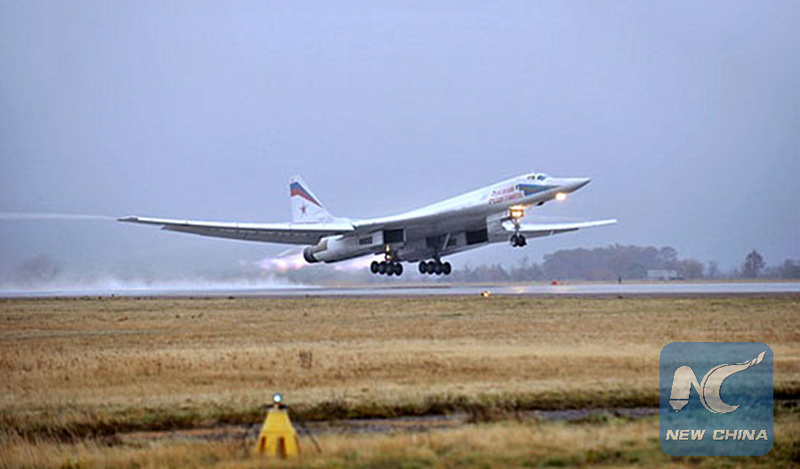 MOSCOW, Oct. 31 (Xinhua) -- Two Tu-160 strategic bombers of the Russian air forces have started a planned 10-hour flight over the neutral waters of the Barents and Norwegian Seas, the Russian Defense Ministry said Wednesday. The flight is being carried out in strict accordance with international rules on the use of airspace without violating the borders of other states, the ministry said in a statement, adding that the crews will return to their home airfield after completing the mission. Flights over the neutral waters of the Arctic, North Atlantic, Black and Caspian Seas, and the Pacific Ocean are performed by Russian long-range warplanes on a regular basis, it said. It did not mention whether the Tu-160 flight is connected with the ongoing drills of the North Atlantic Treaty Organization (NATO) held in the region, the largest since the end of the Cold War. The Trident Juncture 2018 exercises are being held in Norway and its surrounding seas from Oct. 25 to Nov. 7.